The Coalition will today unveil plans to introduce $29.8 billion in tax cuts for small employers five years earlier than originally planned. The government struck a deal with the Senate last year to gradually slash taxes for all companies with an annual turnover of up to $50 million. 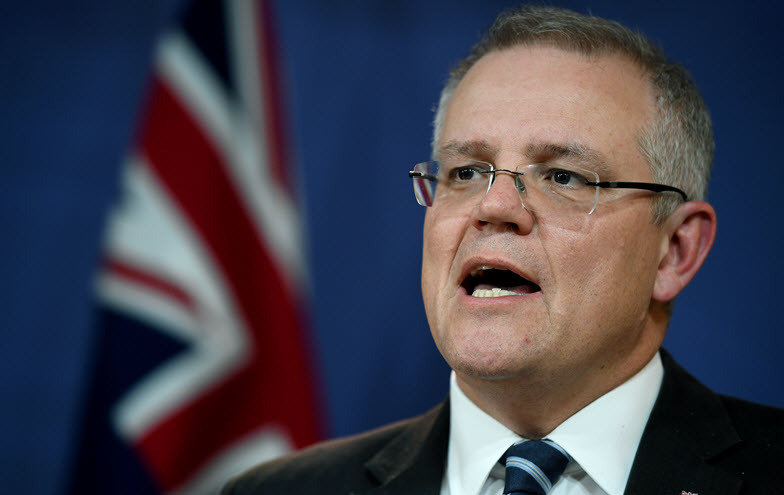 According to The Sydney Morning Herald, Prime Minister Scott Morrison will today announce a plan to bring forward the 25 cents tax cut to 2020, as well as a tax boost for unincorporated small businesses in order to equalise the treatment of sole traders. The move contrasts with Opposition Leader Bill Shorten’s recent education announcements and Shadow Treasurer Chris Bowen’s announcement today ($) that Labor would revitalise federal-state economic reform with a new Council of Australian Governments group. All three will speak at today’s Melbourne Institute and The Australian’s Economic and Social Outlook conference. Energy companies and users are considering self-regulation after the Coalition’s five year policy vacuum claimed the National Energy Guarantee in August. The Australian Financial Review ($) reports that members of the Business Council of Australia’s Energy Climate Change Committee privately discussed an industry-wide program for emissions and reliability obligations in the name of fostering grid and investor stability. Speaking of, the Sydney Morning Herald reports that Australia’s lack of planning on grid infrastructure in the face of new renewables generation has caused congestion and caught up with investors, such as Japan’s Mitsubishi UFJ Financial Group, who warn their recent boom is likely to slow. An inaugural EMRS poll for the Hobart Lord Mayoral race has found that, of 2680 respondents, just 548 confirmed they intend to vote. In a terrific indictment of local politics, The Hobart Mercury ($) reports that 42% of the people who did say they would vote were unable or unwilling to name a preference. Independent Anna Reynolds has lead the way for named nominees at 15%. In a performance we sadly had to cut for space, the Prime Minister does his best to dodge questions over (currently escalating) suggestions in the Ruddock religious freedom review. Prime Minister Scott Morrison and Opposition Leader Bill Shorten will each makes speeches on day one of the two-day Outlook Conference, a national forum on economic and social policy. The CREATE Foundation will host an event for young people to question Victorian politicians on how to fix state care, to be introduced by Principal Commissioner Liana Buchanan and Commissioner for Aboriginal Children and Young People Justin Mohamed. Governor of Victoria Linda Dessau will launch a convoy of over 300 celebs and footy players in the Daniher’s Drive 2018, a charity fundraiser for motor neurone disease. Australian rower Drew Ginn will be inducted into the Sport Australia Hall of Fame. Headspace CEO Jason Trethowan will address a national Headspace Day event being held as part of National Mental Health Week. The third Diversity and Inclusion in Sport Forum will be held at Olympic Park. Winners will be announced for the 2018 Premier’s Sustainability Awards. Supercars, Visit Victoria and the state government will make an announcement at Albert Park. Speakers include Sports Minister John Eren and Supercars CEO Seam Seamer. Médecins Sans Frontières (Doctors Without Borders) will hold a press conference over the Nauruan government terminating its contract on the island. Sir Richard Branson will launch the world’s first meditation flight on Virgin Australia. International child rights organisation Plan International will launch a report highlighting the issue of street harassment in five cities, including Sydney. The house economics committee will begins its biannual review of the four big banks, with CBA and Westpac CEOs set to appear first. ACT Minister for Climate Change and Sustainability Shane Rattenbury will join the High Commissioner of the Republic of Fiji Luke Daunivalu as part of the international initiative “Powering Past Coal Alliance” at Mount Majura solar farm. Director of the Australian War Memorial Dr Brendan Nelson will launch a new exhibition, “After the war”, exploring the impact of conflict on Australia. Day one of the two-day 2018 National Landcare Conference and Awards, to feature a keynote from Director of the ANU Climate Change Institute Professor Mark Howden on “Towards a climate change strategy for landcare”. Environmental economist Professor Tor Hundloe and scientist Keeley Hartzer will launch their book The cheapest electricity on Earth at UQ’s Global Change Institute. Journalist Madonna King will launch her latest book Fathers and Daughters at St Aidan’s Anglican Girls’ School. The Department of Foreign Affairs and Trade will conduct consultation roundtables with members of the WA’s creative industries, as part of the federal government’s “Soft Power Review” to understand Australia’s international reputation. Hundreds of protestors will rally at Parliament House for a permanent, legislated ban on fracking in WA. Former NT Chief Minister Clare Martin will address a leadership event for women in the NT public service. ABC journalist and newsreader Nas Campanella will address the Royal Society for the Blind’s 2018 World Sight Day event. Opening day for the Global Centre for Modern Ageing. Neurological Alliance Tasmania will host a Mental Health Week event spotlighting the impacts of neurological conditions on mental health. Day one of the Royal Australian College of General Practitioners three-day annual conference GP18, to feature speakers such as Health Minister Greg Hunt. The Australian Commission on Safety and Quality in Health Care will release new standards on preventing blood clots during or after stays in hospital. Defence Minister Christopher Pyne will visit Indonesia following the September earthquake and tsunami. Opening day of a meeting between G20 Finance Ministers and Central Bank Governors, ahead of the leaders summit in November.